today was a busy day for our Yoo Seung Ho!! but happy to see his happy smile!! With MBC’s “I Am Not a Robot” coming to an end on January 25, Yoo Seung Ho, Chae Soo Bin, and Uhm Ki Joon gave their final thoughts on the drama. “I Am Not a Robot” was a romantic comedy that told the story of a man who has an allergy to humans and a woman who has to pretend to be a robot. The drama ended with high praise for the actors and viewers enjoyed the sweet story that unfolded. Yoo Seung Ho called the drama, “A heartwarming drama that warmed everyone up this cold winter,” and said, “As this was my first time being in a romantic comedy, I worried a lot about my character and how I should portray him, and I think that has helped me grow and learn a lot as an actor. The time I spent as Min Kyu will remain with me for a long time as happy and meaningful memories. I was happy to have the honor of working with such a great director and crew, and I also want to thank the actors who worked alongside me. Finally, I want to thank all our viewers who gave us their unwavering love and support". this!! Yoo Seung Ho's words are a big relief to all of us! !Yoo Seung Ho is an actor who cares about learning and giving as much as he can as an actor and this drama gave him that satisfaction so the drama having a low rating didn't and won't affect his future decisions regarding his upcoming projects and we can hope for pictorials and many interviews!! pleaaaaaaaase Yoo Seung Ho-ssi!! Yes his words are a big relief , despite the bad ratings at least we know he enjoyed his filming time . Just like how I predicted, he learned a lot from his first rom com, the PD and the actors. At least if he doesn't do interviews, we should believe his last words saying farewell to viewers. Have you noticed how he smiled when he took a selca with the PD? The last time I saw him smiling widely like this with a male was with Park Chul Min in ruler when they took a selca together. It's the same smile and the same pose. It's litteraly a copy-cat And they hugged tightely in the other pic. It just proves the PD really likes YSH and has become his fan, and also YSH is fond of him. It's reciprocal. They have become really close. So it's no wonder the PD sang praises about YSH and his talent and articles stated they had an amazing chemistry and hit it off immediately. My low-key wish is too see them collaborating again but only when MBC will have solved all the internal issues and will have become a better TV station. yeah that was so sweet and adorable and we can see how both are affectionate toward each other!! I hope they do work on another drama together in the future and in the meantime Yoo Seung Ho can pick projects from different stations as well!! Also glad to hear his positive thoughts about the drama after it ended. I was afraid he would be on total hiatus. I hope that he would agree to do post-drama interviews and pictorials. I really love reading his interviews. I was a fan of YSH before IANAR. My first drama of him was WBS. I couldn't believe that he was still in his teens back then. He was so good and I cried so much when his character died. I've watched Imaginary Cat and Ruler because of him. I was so happy when I heard that he accepted a romcom. My thought was, thank God YSH will not make me cry this time. Little did I know that it was not true. Hahahaha! I can actually write an essay on how much I love YSH as KMK but i am holding it back. I will behave @BerouI promise. I will be camping here until his next project. I hope that it wouldn't be a long wait though. I will miss seeing him onscreen but he also needs time to rest so i wouldn't be too greedy. Thank you in advance for the news and pictures. Hi chingu!! happy to have you with us here!! hhhhhhhhhh why do you need to behave here?!! and who can actiually? write the essay and I'll read it with pleasure!! and yeah as long as he feels satisfied with his acting in the drama then we can expect him to do many interviews and pictorial hopefully!! @blissfullyblessed I'm really curious about your essay, I wouldn't mind at all if you write it and share it here . We haven't actually talked about his character, KMK, here. Now the drama is finished, we can discuss about it and give our overall impressions about YSH's acting, the drama, his character. I also really do hope he will do some interviews and magazine photoshoots !! Come to think of it, Remember was a drama with high ratings but YSH disappeared completely because he felt unsatisfied. So I deeply believe as long as he is happy with what he does and becomes confident, he will not disappear like he did in 2016. He might feel burdened by the bad ratings but the drama is far from being a flop, and besides I read so many positives comments on naver. @Berou @sakura2016 Omona! Once I pop I can't stop so I need to refrain myself from talking too much. Hahaha! Actually, I always write long rants per episode for IANAR but would always end up writing 2 paragraphs at Soompi or worse none at all. Funny thing is that 75% of the content are all about KMK/YSH. I know, I know CSB was so good as Jia/AJI3 but KMK is YSH. Enough reason to love KMK more. Kekeke! I watch IANAR episodes before I sleep or even during lunchtime at work. That's how obsessed I am with the drama. I read from a forum in FB that starting January, IANAR was always the top searched topic on Korean portals. I would like to believe that the low ratings were not because the Koreans did not like it but maybe because majority of IANAR's audience were younger, thus prefers watching it online than on TV. One of the things that I love about YSH is that he is able to balance his personal and private life. ( I actually call him "The elusive YSH". Hahaha!) He doesn't have SNS that's why his IV's are really precious. Post drama IV's are very much welcome. YSH is a first class graduate ninja. Once he finishes a project he goes MIA and leaves his fans without any updates lol. I've got used to his lifestyle and the way he handles his acting carreer. When he goes MIA, I go watch other airing dramas. Then when his dramas news are released I come out from my hibernation period too and support him. I actually like it, it gives me time to discover new faces and talent or go back watching actors/ actresses I like. I think so as well!! I saw how many and many great comments there were on naver so our drama and Yoo Seung Ho were soooooo loved from the dramas viewers but they are more of internet users I believe!! hhhhhhh "elusive Yoo Seung Ho" it fits him well!! as much as I it's hard to have no updates about him till we get updates about his new projects but I love that about and for him!! he gives his best and all for his projects as an actor winning our hearts and admiration but he also doesn't live his life only for that but lives as Yoo Seung Ho the normal person who enjoys the normal life like all of us (wait most of the people have SNS acoumpt actually so he's special even among normal peole hhhhh) and knows how to keep them seperated which is admirable and one of his special charms as well!! and speaking of his VLives our chingu @Berou shared them with us and I'm sharing them again with you!! and this is Ruler's VLive that I believe you watched before but here it is again!! it's good as long as it doesn't last long or we go crazy wanting to see or hear anything from him!! let's hope he'll be back soon to us with a great project and being and action one would be the icing on the cake!! let our fantacies come true please!!!! It makes me happy to hear all his positive thoughts after finishing IANAR. Glad that he learned a lot and really enjoyed his time filming it. Please get good rest YSH, you worked hard and did an amazing job playing KMK! But, I too am hoping he’ll eventually accept post drama interviews/pictorials. I finally finished reading all his interviews from the first page, and copying his line from IANAR’s last episode, “What should I do? I like you even more.” Like he is such a humble young man. And speaking of IANAR, I showed the first 4 episodes of it to my mom last night and I swear every time YSH appeared on screen, she said out loud how handsome he is. She also said she likes it so far, and since it’s romcom she won’t cry at all unlike in Remember. Uhh good luck mom. I hung out with two of my friends today who also just finished watching Remember. They said it was the first time they cried so much watching a kdrama, but they loved the show anyway, and praised YSH for his incredible acting skills. So I already told them about IANAR and they’ll get on watching it to heal their hearts after crying so much in Remember. You guys are really encouraging me to watch Remember. I know that the drama was so good but I'm afraid of crying buckets of tears. I do have very shallow tears and gets very emotional while watching dramas. Park Min Young is one of my actress bias which means that PMY + YSH is equivalent to a very good drama but then again YSH + PMY means a river of tears. YSH doesn't only make me cry, he makes me sob everytime. I am a hopeless romantic and KMK's journey of love in IANAR felt like me falling inlove again for the first time. That is the reason why KMK was very endearing for me. The joy and the pain in falling inlove was executed very well. YSH is really one of a kind. Just finished watching his movie The Magician and I love it. I would also like to see him doing an action movie/drama. I really admire his fighting skills in WBS. @sakura2016 I am not also good with words since English is not my first language ( it's not even Filipino since I grew up in a province where we have a different dialect ) but I guess you will agree with me that our love for YSH withstands all these so called language barriers. Hahahah! So sad that I missed the fun at the Rulers thread because of some work issues last year but glad that I was able to log in to Soompi for IANAR. In MBC’s “I Am Not a Robot,” which aired its finale earlier this week, the actor put his lovable charms on full display as Kim Min Kyu, a character with both wealth and looks. The role allowed him to show off his handsome appearance, charismatic manliness, cute behavior, and sweet, caring side. Unsurprisingly, he quickly became the ideal type of many viewers. Yoo Seung Ho particularly made viewers’ hearts flutter throughout “I Am Not a Robot” with his endearing physical displays of affection with Chae Soo Bin. Viewers couldn’t help smiling as they watched him hold her hand, hug her tightly, and kiss her passionately. Yoo Seung Ho also showed his sweet side by putting a jacket around Chae Soo Bin’s shoulders and affectionately stroking her hair. His gentle, considerate manner reminded viewers of the way a boyfriend acts in the beginning of a relationship. The actor’s adorable eye smile didn’t hurt either! HAHAHA come and join me chingu!! I would've never started watching this drama if it wasn't for Yoo Seung Ho!! (why did he have to do that to me?!! ahhhhh) just prepare as much tissue boxes by your side because you'll need them!! ah hhhhhhhh but he was great there so it's totally woth the suffering!! true!! starting from the second he said with his swoony and deep voice and gaze that Aji3 is to only look, listen and care for him we and Ji Ah were already gone and it's unbeliavably admirable how we kept falling for him more and more till the very end!! watch Kim Seondal movie as well!! he was so funny there though he made me cry as well!! but that's Yoo Seung Ho we're talking about so crying is part of the deal!! so happy to read such articles!! yeah he grew to be this charming young male lead actor who steals women's hearts!! - This leads to my third point : Gucci and YSH have good partnership and relationship. 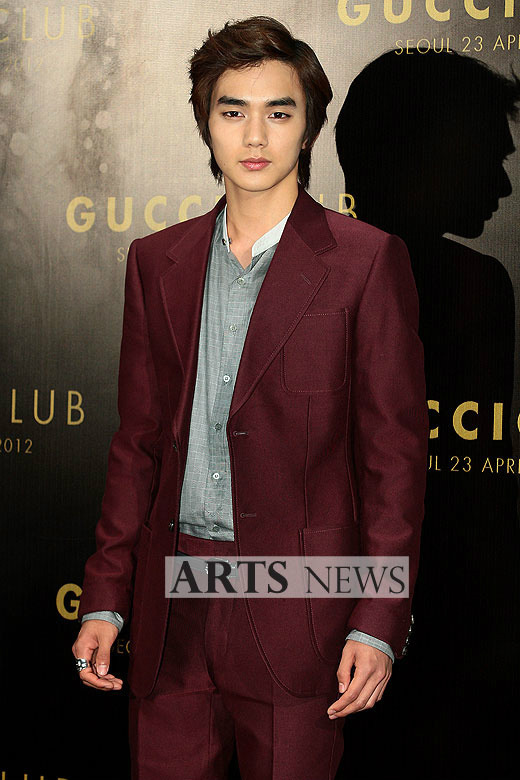 Is YSH a fan of Gucci brand ? Why Gucci, out of all famous brands ? 1st thing, thanks for the treat 2nd yeah though I'm a new yoopy but I was surprised seeing him attending Gucci's event since it's so not like him going for such events (though I'm happy he did ) and it actually made me think he actually love that brand at 1st but I never realised he actually had a relationship and partnership with the brand and wore many of its outfits so their relationship is still there?!! he still wore from Gucci at IANAR's press conference(?)!! I'm sorry I'm not much knowlegeable how things are in this world of brands and actors even though I know a little bit! !